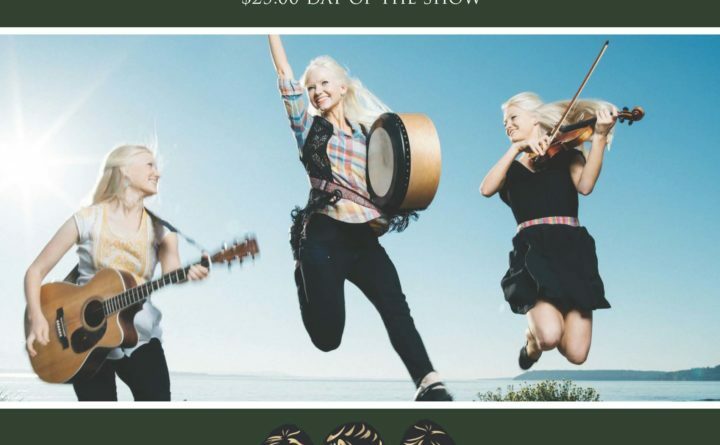 The Gothard Sisters are a dynamic group of three sisters, whose impressive array of talents have set them apart as one of the most refreshing and compelling acts in Celtic-roots music today. Hailing from Edmonds, Washington, the Gothard Sisters first began playing together as a violin trio at the local farmer’s market, working their way onto stages at local fairs and festivals. The band recently performed at the Millennium Stage at the Kennedy Center in Washington D.C., completed several national concert tours of the United States, and are well-known musicians on the national Celtic festival circuit. In December 2016 The Gothard Sisters charted on Billboard’s World Music Chart with their latest Christmas album, “Falling Snow”, alongside notable Irish music phenomena Celtic Woman and Celtic Thunder. The sisters have produced three albums, “Story Girl”, “Compass” and “Mountain Rose”- and self-produced, filmed and edited a collection of music videos at locations across Washington’s. Their music has been featured on NPR’s “Thistle and Shamrock” program and PBS’s “Woodsongs Old Time Radio Hour” broadcast. Tickets: online $20, https://bangorceltic.org/tickets ($25 at the door).